In the lead up to the 2015 Budget, organisations and networks working with children and their families are calling for real and effective action to reduce child poverty. 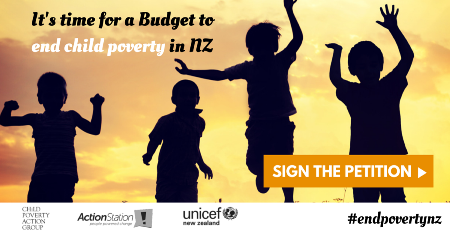 Check out the online Action Station petition asking ‘Is this the Budget to end child poverty?’. The link between high inequality and child poverty is strong and we have written about this in related posts, about the high cost to our society of child poverty, the fact that is our children who bear the impact of inequality the most and we took a look at the 2014 Budget and concluded that not enough is being done to really reduce poverty and inequality.